IT’S ALMOST MOTHER’S DAY AND THE UBIQUITOUS COLOR IS PINK. Fresh pink cards loaded with flowery phrases fill the card racks. I appreciate pink. It is one of my favorite colors. But when I contemplate my mothering, the pastel hue does not capture the depth and ferocity of my mother love. The moment I held my first son in my arms I was overcome with emotions. I had just completed a marathon and he was the prize. After hours of pain, the endorphins that flooded my body also resulted in a surge of power. I had delivered a human being into this world and I was responsible for him. I would protect him with every ounce of energy I had. I had become a warrior mom. I parented with the fierceness of a grizzly bear. I battled against anything that could hurt him from viruses to sharp corners on tables. I made sure he had his armor-car seats, bicycle helmets, and whatever else he needed. I trained him to hold my hand in the parking lots, to never walk to the pond alone. I was ever vigilant. As more children filled the nest, my duties multiplied. But I did not let up. As they ranged further from home there were new battles. I trained them to resist peer pressure, evade negative situations, and overcome bullying. The battles changed—now I was in the rear echelon unable to protect them in every situation. It was up to their training and character to meet the enemy and persevere. But I could still counsel them every night over an after-school snack. The day finally came when each one launched and they were on their own. In my case, each one chose military service. My responsibilities as Mom-in-Chief changed. I was the keeper of the home front, designated to watch and worry and support from afar. The intense desire to protect my children continues, and I carry them virtually with me everywhere I go. My mother love is red—passionate and intense with the desire to keep them safe. It is blue with the tinge of tears of worry and potential harm. A mixture of those colors results in purple. That color happens to also be the symbol of joint forces, a description of my brood with one member in each branch of the armed services. No pale pink for this mom. Purple is a deep rich color representing undying love and pride. 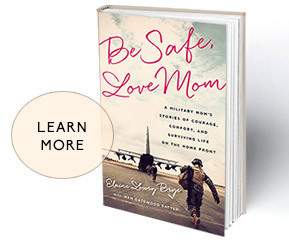 I wrote my book, Be Safe, Love Mom, about the particular brand of courage it takes to let your children grow into warriors of their own. This Mother’s Day, I will be speaking about the book at the great Washington DC bookstore, Politics and Prose. When we were scheduling it there was some hesitation about asking me for a Mother’s Day event. My response: ”There is no place I would rather be when I am apart from my own military kids than with a bunch of other mothers whose kids are serving too. ” And yes—I will be wearing purple. What I love about your book , blog and personality Elaine is that you say everything that I think…. but I thought it was just me. You are a blessing!